I absolutely love seasonal decor. I think it stems from my obsession with appropriateness, but much like one should always dress for the occasion, an impeccably dressed home is always appropriate for the season. For this reason, I play to all highlights on the calendar and enjoy the transitions. Hence, coming off Thanksgiving, I’m now easing into holiday decorating. We’ve just barely put the pumpkins away. I’m not one to drag out every last ornament and immediately garland the whole house. I enjoy a slow build. A few berries here, some glittered orbs there. 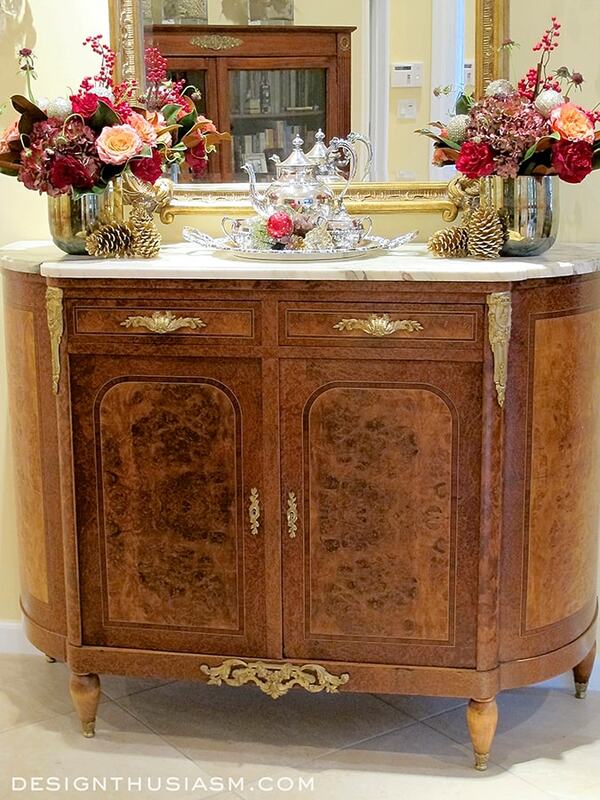 A touch of claret, a hint of moss and always, there’s room for gilding throughout. This year I decided to start with my entryway. 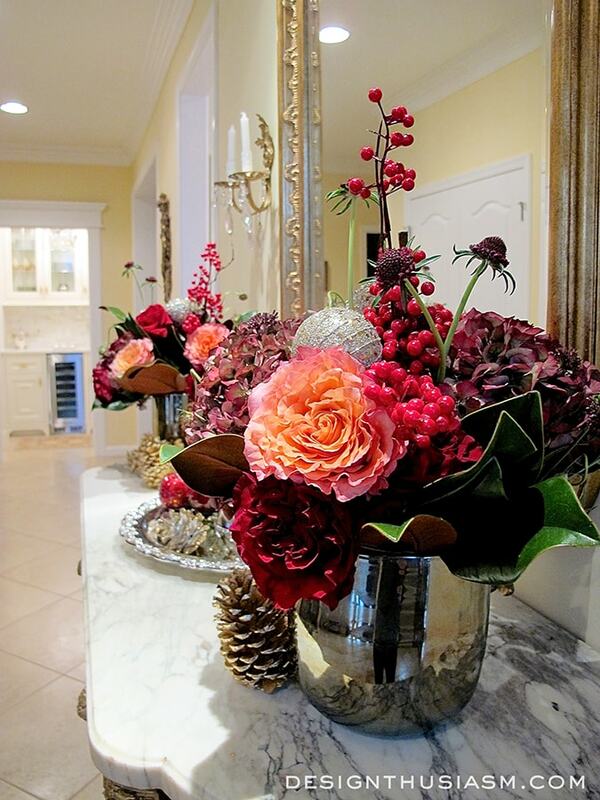 The florals were actually left over from a birthday party we hosted here on Thanksgiving weekend. 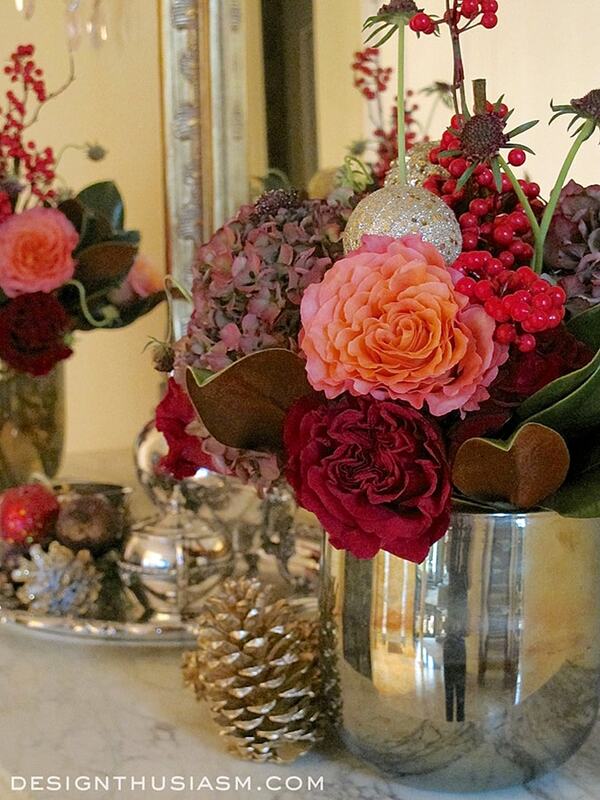 I did a little surgery on the arrangements, pulling out the golden tones and underscoring the richer burgundy hues. I tucked in some berries for added emphasis. The welcoming vignette faces the front door and is the perfect spot to begin my holiday decorating. 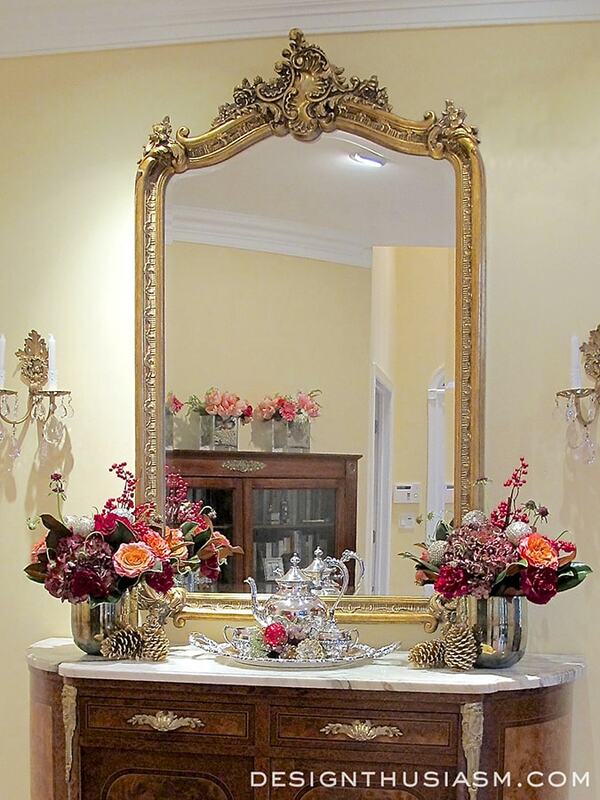 It shimmers from the silver tea service to the gilded French mirror. 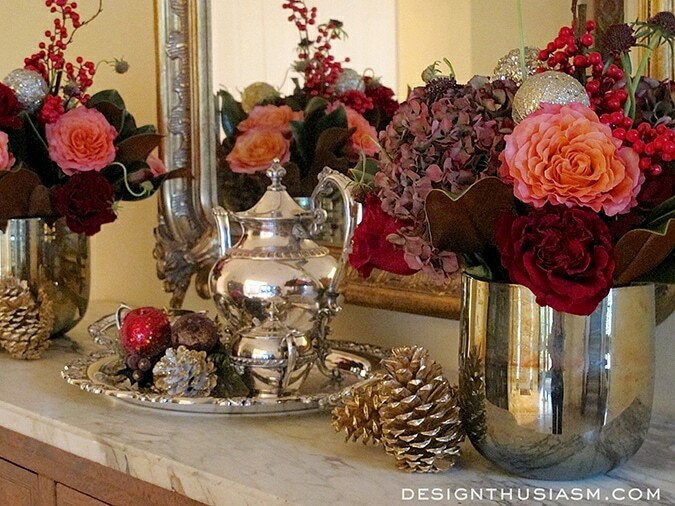 It seemed only natural to add a few glittered balls to the festive arrangements to begin to add some holiday cheer. 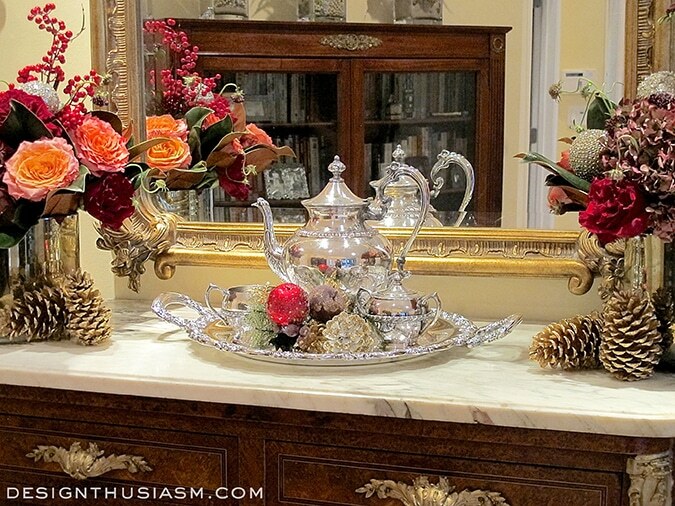 The underpinning for this holiday vignette is an antique burled wood bar server that hails from France. 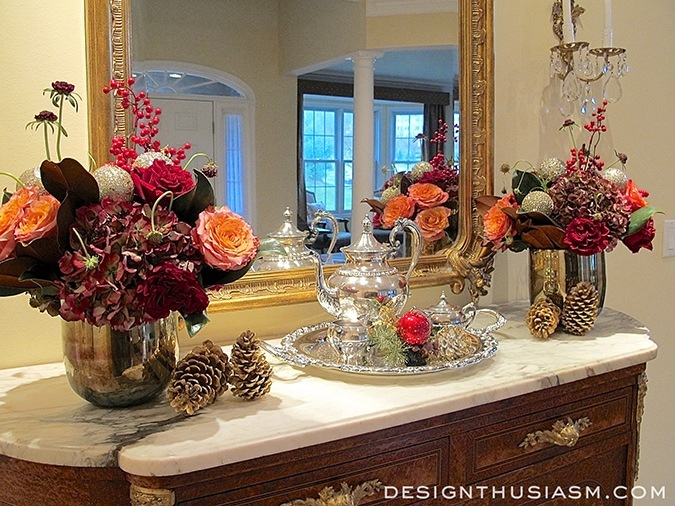 The rich wood makes a wonderful backdrop for the merry colors the season favors. Some simple holiday greenery is introduced here, along with a hint at ornamentation and some glittered bits of nature. 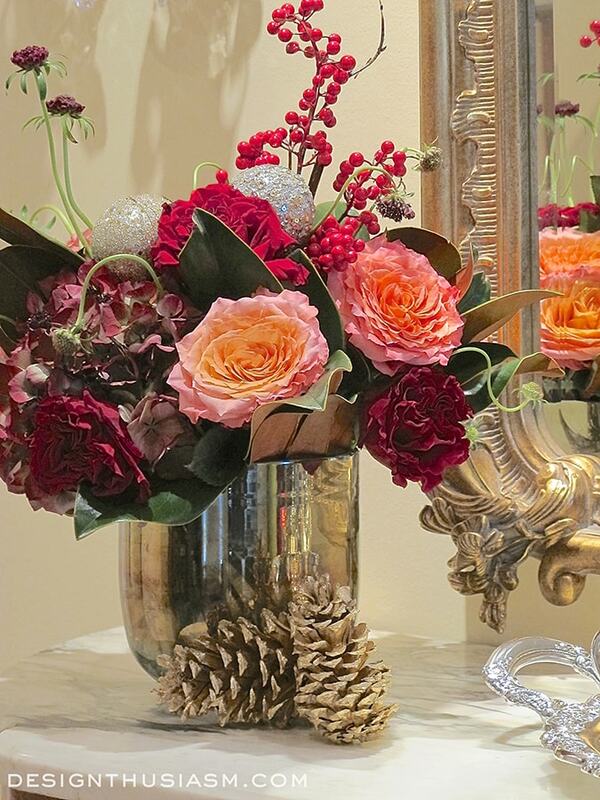 What I love most about decorating for the holidays is the warmth of the rich colors and the brilliance of the glimmery objects. 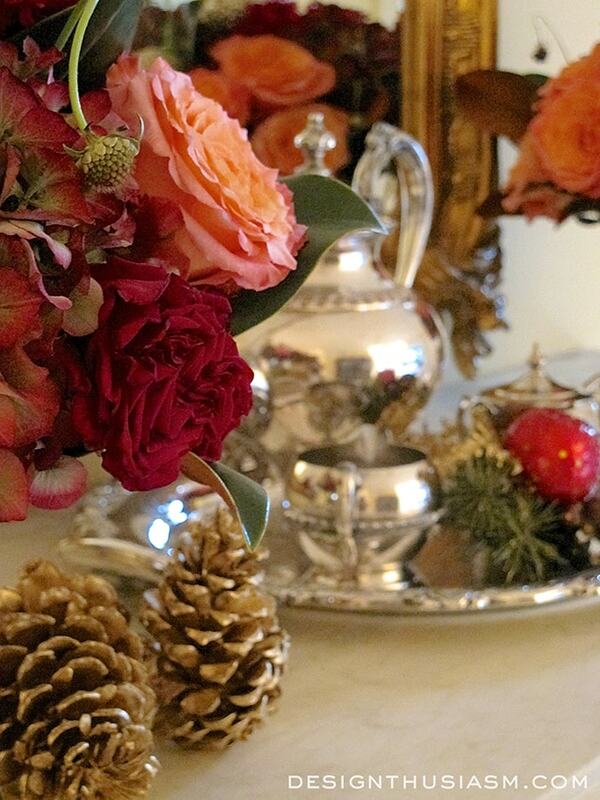 Both reflect our feelings of delight in being with family and the specialness it deserves. Of course, in the interest of full disclosure I don’t actually celebrate Christmas, at least not from a personally religious standpoint (I’m Jewish). 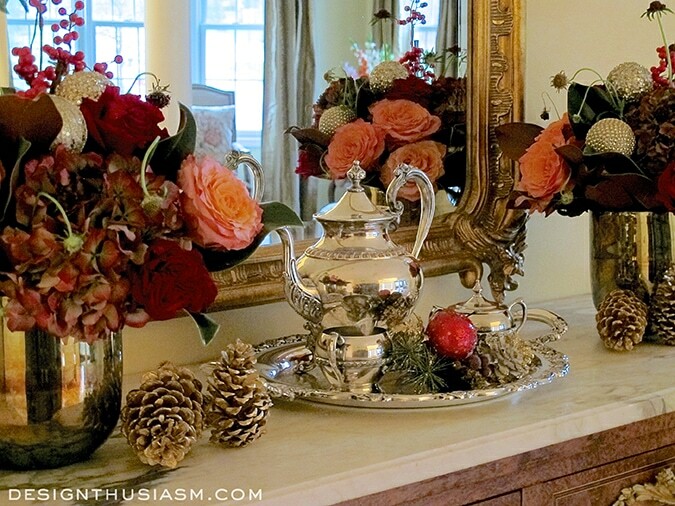 So my holiday decor is always nature inspired and winter focused without getting too into the religious imagery. But oh, the fun I could have if I could add some angels in! 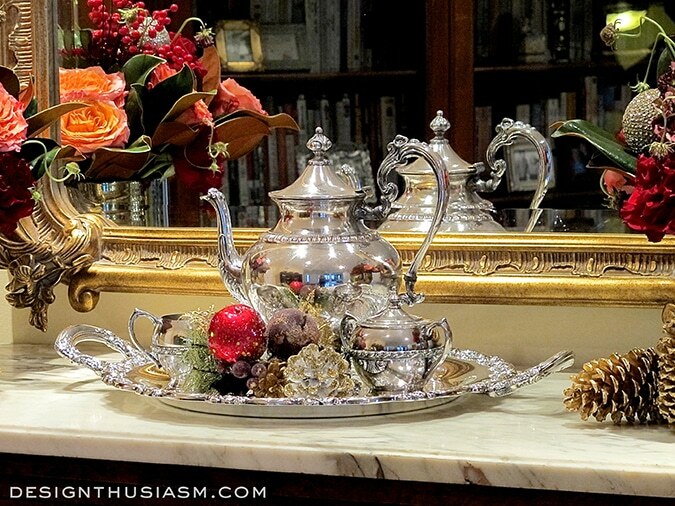 The gilded and crystal sconces that flank the server were found at an antique shop in Sorrento, Italy on a summer trip, but they work perfectly with my sparkling holiday setting. As the flowers begin to wilt, this server will become a platform for more winter greenery. The closer we get to the holidays the more thematic decor I layer in. 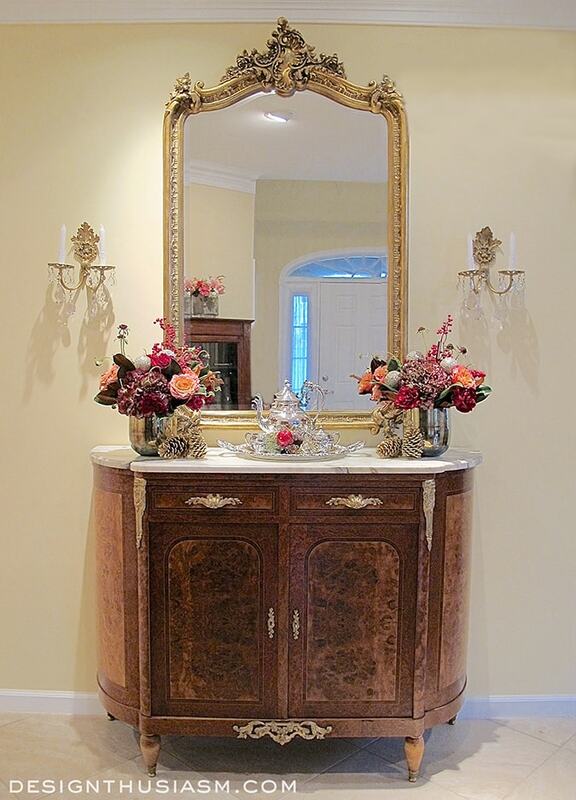 It’s all part of the progression of movable and transitional decor. 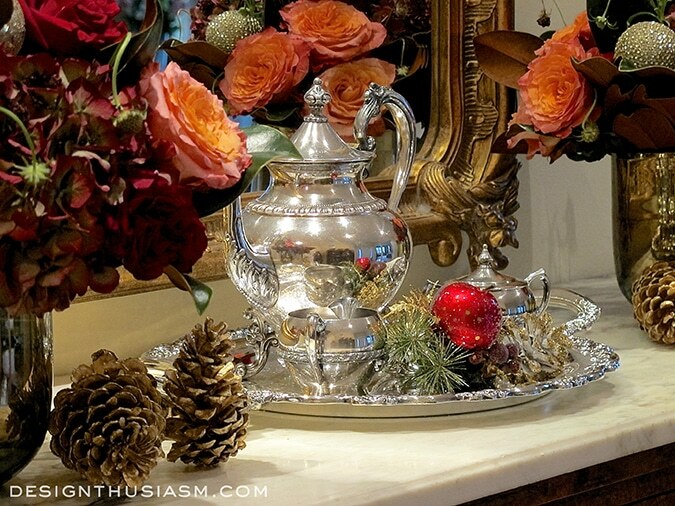 You can also visit my posts from last December, summarized here: Holiday Decor and More… I welcome your feedback, as I’m an amateur holiday decorator… but I do have many many years of Christmas envy, so it’s been mulling around in my head for quite some time! Linking with BNOTP, Dwellings Amaze me Monday, A Stroll Thru Life Tuesday, The Scoop, Savvy Southern Style Wednesdays, Pocket of Posies, Jan Olson Thursday, Share Your Style Thursday, From My Front Porch to Yours, Think and Make Thursday, The Creative Exchange, Feathered Nest Friday, Romantic Home Friday, Shabby Nest Frugal Friday, One More Time Events, Crafts a la Mode Weekends, Sundays at Home. Thanks so much, Linda! Yeah, I’m a big silver fan… 🙂 Crazy busy day, but I can’t wait to circle back and visit the other links. Thanks so much for stopping by and taking the time to comment!! Merry Christmas to you too! It’s all just stunning! 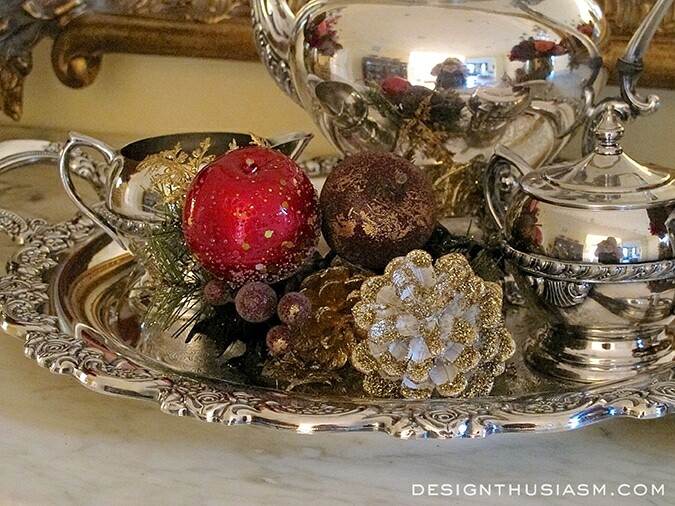 I love the gilded pine cones and the mercury glass. I am much more a silver lover than gold! Thanks for sharing with SYC.